1. What IS a Mandala? It's a circular image designed to reflect the qualities of one-ness and the universe. It can be drawn, painted or constructed out of grains of sand on the ground. In fact, if you have a circular picture of some sort which has been created with a mandala in mind, then it probably is one! 2. Are they connected with any particular religion or spiritual path? They may have been in times past, but these days a wide range of faiths, religions and philosophies have and use some form of mandala . . . although some might not call them that! The whole point is perhaps that a circle is universal and any spiritual path worth it's salt will want to help us to appreciate the interconnectedness of all things. Thus a circular image, whatever the image is actually of, can be considered part of the message and intent of bringing the spiritual dimension into the physical dimension. 3. So it's a matter of Intent? - of creator or user? As with many things in life, it's our conscious intent that determines whether or not we 'get something out of' a given tool or symbol . . . such as a mandala. Even if an artist is particularly inspired and creates what they feel is a powerful mandala, it won't work with everyone. Individuals who are blocked from spiritual experience will just see a picture in a circle. 4. 'Powerful' mandala? Experience? What DOES a mandala do? How does is work? Mandalas, like other recognised spiritual symbols (such as the 'Om' or Reiki symbols), help us to connect to our higher, spiritual selves. Some belief systems would probably describe this as 'connecting to the divine', but whether this divinity, this universal consciousness ('God' if you like) is within us, outside of us or both is up to each of us to decide for ourselves. 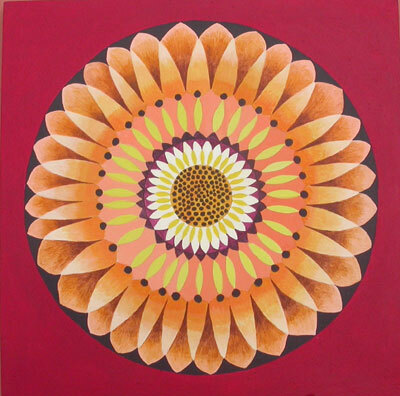 It's probably better to enjoy and allow the experience of connection that a mandala can enable without trying to analyse or understand it: the whole point is to rise above the limitations of the conscious mind! Thus, when we allow a mandala to engage our soul, and stop trying (to make it work, or to understand it) then we may (or may not!) have some sort of 'mystic experience' . . . i.e. a sense of transcending normal mind and body functions and feeling 'at one' with . . . well, life, the universe and everything! 5. How do you use a mandala? At the simplest (and probably least effective) level, we look at, focus on or perhaps meditate on a mandala that someone else has created. In this case the mandala gives focus to the meditation, giving the mind something to hold it's attention . . . in the same way as focusing on a lighted candle or chanting might do. At the next level, we might take the outline of a pre-drawn mandala . . . and colour it in ourselves. Now we're becoming more directly and personally involved with the mandala and, in our experience, are more likely to truly engage with it. With the mandala intent and the outline providing guidance we can throw ourselves into the creative experience. We'd suggest however that the best level to use mandalas is to make your own. You don't have to be an artist and it doesn't matter what media you use - simple crayons or felt-tip pens are both easy to use and flexible in what they can produce. Now we can allow ourselves to be truly inspired, with our conscious mind busy getting the structure and circular form correct we're free to be spontaneous in choice of colour, etc. The more we allow ourselves to enter into the activity, the more we find we're guided in what we draw . . . and the more we feel part of the creative process . . . and know it's a divine as well as artistic past-time. 6. But WHAT do we draw or paint? Whatever you feel inspired to! If nothing comes to mind, just allow yourselves to pick up a crayon and allow your hand to be guided. Mandalas come in all styles and forms, from a single picture of a Yin-Yang symbol to a 'seasons' picture to a very precise and detailed geometric pattern. Although many available mandalas seem to be of the latter sort, looking more like they've been computer generated, that doesn't mean this is the way a mandala has to be. On the contrary, I'd tend to argue that a more 'free form' picture, which isn't perfect in it's symmetry, is as good if not better than a 'perfect' pattern. 7. Why? Isn't the universe perfect? Yes indeed, the universe is perfect . . . but when did you last see a perfect circle or sphere in nature!? Think about it, the earth is not exactly spherical - it is slightly elliptical (and there is also Mount Everest to consider!) Likewise none of the orbits of moon, earth or other planets is a perfect circle . . . always there are . . . well, imperfections . . . to our rational mind. This is the reality of the universe we live in. It's our conscious and conditioned minds that insist on everything being mathematically perfect. Real life just isn't like that! Thus, to be a true reflection of the universe, our mandala can and maybe needs to include some lack of symmetry, some free flowing form . . . rather than being overly controlled by our logical minds. 8. Some consider mandalas to be 'portals': what does this mean? In that a mandala connects us to the divine in ourselves and the universe at large, then through a mandala we're becoming part of a far greater whole. We can certainly consider that it IS a portal to 'other dimensions of space-time'. if you'd like to interpret that as connecting us to another galaxy or to communion with beings from other other planets, that's just a matter of belief and choice of words to describe your particular experience. The only fact here is that a mandala can enable some wonderful 'out of this world' experiences, often accompanied by feelings of deep calm and fulfilment. Anyone who has had such a mandala experience can share this sense of wonderment . . . but may not want to share your belief that it came from another galaxy! In a similar way, some creators of mandalas will tell us that they've channelled them from some other dimension. To them, they have. They've also probably had a deep sense of connection in the process. Whatever! If the mandala has been genuinely inspired, then it will be both a powerful symbol and inspiring work of art. 9. So mandalas are where art and spirit meet? Absolutely! I like to emphasised how art can enable spiritual development and and sense of divine connection . . . and how a spiritual dimension to a creative process can bring about truly great and inspired work of art. It's about bringing heart and soul into our painting (writing, etc.) . . . and our lives. 10. How can I find our more? By exploring the various books and web-sites on mandalas, you'll get a feel for which traditions of mandalas appeal to you and the level (see Q5) you're ready to engage with them. Then it's up to you: Go and do what your heart and soul guide you to do. 11. What can I expect from one of Keith's Mandala Workshop? Enabling you to use Mandalas, back home, in a way that's right and helpful for you in your own life and in relation to other practices, personal growth work, etc.